Mary Anne Le Bas has sent an SCMP article, Six home-grown Hong Kong trades at risk of dying out, published on 21st June 2015. The third of these is about the Yuet Tung China Works which has been producing hand-painted porcelain since 1928. The article begins: Tso Chi-hung is the manager of Yuet Tung China Works, the last company in Hong Kong to produce hand-painted porcelain. Fifty per cent of its output is tailor-made. It supplies Hong Kong’s major hotels with bespoke ranges, and British nobility and Vatican bishops with dinner services emblazoned with coats of arms and family crests. 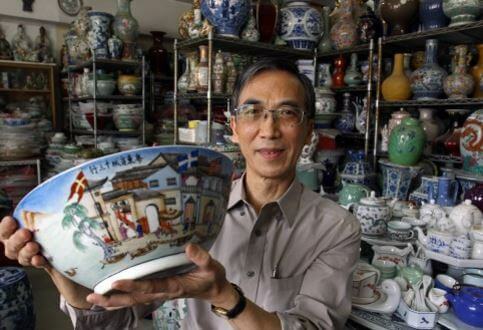 The factory, in Kowloon Bay, is a trove of ceramic treasures, with vases, ginger jars, dishes, cups and plant pots piled from floor to ceiling. “My grandfather started the business in 1928, so I’m the third generation to be running it. I was born in 1949 and grew up in the factory. I’ve been here my whole life. “As a child I helped my father with the colour mixing, firing and packing – everything except the painting. At that time, we had a very large factory. It was more like a small village, with over 80 people – both family and employees – living and working together.